KARACHI: The high-level trade delegation of PAJCCI from Afghanistan visited Karachi from September 25th to 29th, 2013 with the aim of exploring mutual economic opportunities. The delegation was led by Khan Jan Alkozai and comprised of various businessmen. The prime objective of this visit was to provide an opportunity to the business community across the border to interact with each other for mutually beneficial bi-lateral economic deals. 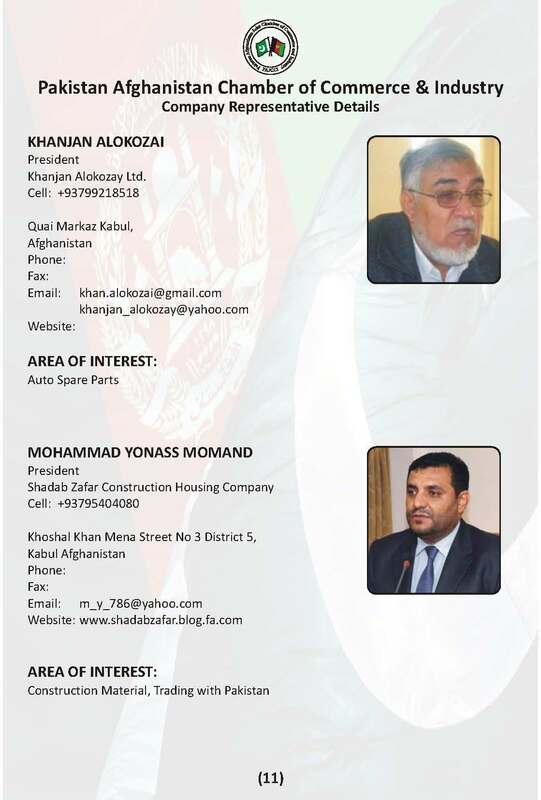 During the stay, the 5th Board Meeting of Pakistan Afghanistan Joint Chamber of Commerce & Industry (PAJCCI) was held where Presidency transition took place whereby Khan Jan Alkozai now holds the position of President PAJCCI whereas Muhammad Zubair Motiwala would be the Co-President of the Chamber. The Chamber already has an agreed upon procedure for rotation of leadership amongst the Pakistan and Afghanistan Chapters respectively. Directors of PAJCCI also met custom clearing and forwarding agents and discussed pressing issues pertaining to transit trade and ISAF / NATO container scam. President and Co-President PAJCCI assured full support for resolution of their grievances. PAJCCI office bearers were also invited at US Embassy for discussing the critical issues across the border and understanding PAJCCI’s stance over those matters. H.E. Mr. Richard Olson, Ambassador US Embassy in Pakistan, showed great confidence in the potential of PAJCCI in ensuring enhancement of bilateral trade ties. Mr. Motiwala sought facilitation from US Embassy in development of trading houses across the borders to reap significant benefits in terms of mutual business development across the border. PAJCCI organized a B2B match making and networking meeting for the business communities across the border which was also attended by a delegation of UK-Pakistan Chamber of Commerce & Industry led by its President, Mr. Razi Khan. Mr. Sharjeel Memon – Information Minister, Sindh was also present at the occasion. He welcomed the board of Pakistan- Afghanistan Joint Chamber of Commerce & Industries (PAJCCI) and all the dignitaries who visited Karachi to attend a very important exhibition and a B2B meeting. He stressed that establishment of such a unique chamber with a vision to promote peace and prosperity between Afghanistan and Pakistan through enhancement of bi-lateral trade is a remarkable initiative by the business community across the border. He greatly acknowledged contribution of PAJCCI in a very short span of time under visionary leadership of Muhammad Zubair Motiwala and Khan Jan Alkozai. He assured full support and cooperation from his office and hoped that this activity would prove to be fruitful and will result in significant joint ventures, investment projects and trading assignments between the two countries. At the meeting, President PAJCCI, Mr. Khan Jan Alkozai welcomed the guests and extended his gratitude towards his counterpart Mr. Motiwala for arranging such forum of B2B match-making and networking activity for the delegation. He showed confidence that interactions like such can establish trust and will facilitate ways for mutual investments across the border. He further announced that in December 2013 an investment conference along with B2B activity on the same lines will be held in Kabul and same avenues to explore opportunities will be provided to Pakistani counterparts. He stated that despite political upheavals, PAJCCI has been able to further establish bi-lateral relationship between two countries and this would further strengthen. He greatly acknowledged 18 months successful leadership of Mr. Motiwala and assured that he would also start his tenure under full guidance from Mr. Motiwala and will try to enhance the benchmark of performance. He also acknowledged role of Mr. Khurshi Marvat, Commercial Attache - Pakistan Embassy in Kabul, Ms. Faiza – Secretary General, Pakistan, KCCI and TDAP who have facilitated the delegation relentlessly for ensuring their smooth visit to Pakistan and also participation in “Expo Pakistan 2013”. He also assured that Multiple Visa facility may be extended to Pakistani businesses through the platform of PAJCCI at the earliest. Mr. Muhammad Zubair Motiwala, Co-President PAJCCI welcomed all dignitaries and delegation at the event. He also congratulated Mr. Khan Jan Alkozai on being the President PAJCCI and believed that during his tenure the landmark figure of US$ 5bn trade would surely be attained. He stated that formation of this unique chamber, which is duly licensed and approved entity by Governments of both Islamic Republic of Pakistan and Islamic Republic of Afghanistan, was an uphill task. He mentioned that FPCCI, an apex body in Pakistan, has prerogative of issuing rights of establishing joint councils and joint business forums and getting recognition from both governments and respective ministries was not an easy task as formation of joint chamber was a totally new concept. Nonetheless with the support of Mr. Khan Jan Alkozai, Mr. Siraj Teli – Chairman BMG, CIPE- USA and British High Commission, with due support from Ministry of Commerce in both the countries, this dream project of business community was realized. Mr. Motiwala also elaborated on significant challenges faced in initial 6 months and outlined the achievements attained by this Chamber in a short span of time including Arbitration across the border, resolution of 8 most important pressing issues related to APTTA agreement which were accepted in APTCCA meeting held in October 2012, constant coordination with Ministries and FBR to help resolve issues, meeting with Prime Minister Pakistan in January 2013 to resolve issues of stranded containers of Afghan importers, resolution of issues pertaining to ISAF / NATO containers scam and cases of custom clearing agents, launching a Trade Survey across border etc. Mr. Motiwala stressed that importance of this forum is to ensure depoliticizing of business activities between the two countries and to curb unscrupulous elements operating at both the sides. He emphasized that only fiscal reforms are the solution through rationalizing the tariffs that will curb the tendency towards parallel trade. 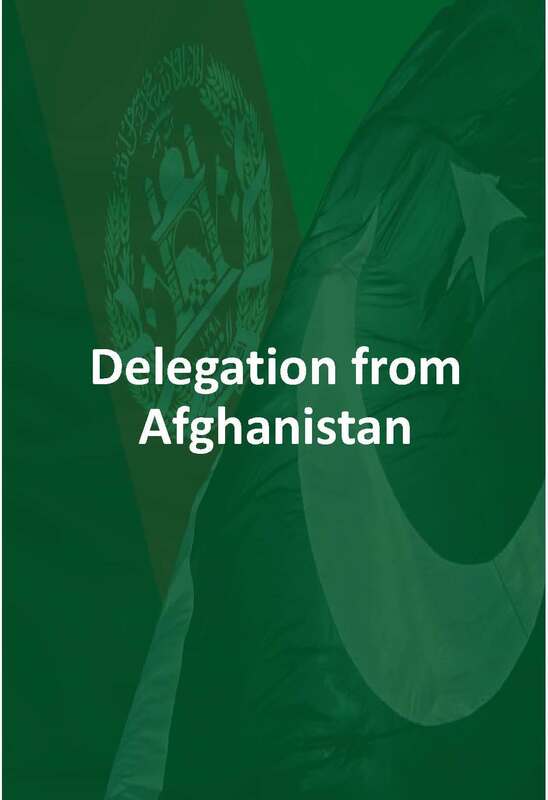 This will help Afghanistan in raising revenues through custom duties and when parallel trade will move into mainstream trade it will improve trade balance of Pakistan by $1.9 billion that would wipe off current account deficit which is only $1.2 billion, which surely is a win-win situation. Mr. Motiwala stated that it is very heartening to note that there are so many entrepreneurs in Afghanistan who are willing to do joint ventures and investments in Pakistan in different sectors. They would be invited through PAJCCI forum and it would be a task of our Executive Committee to ensure realization of these projects for the mutual benefits. He also acknowledged support and hard work of Afghan counterparts and Pakistan Chapter’s Executive body and Secretariat in attainment of desired results backed up by CIPE - Pakistan team led by Mr. Moin Fudda. He reiterated that Peaceful, Prosperous and Progressive Pakistan is answer to extremism and terrorism and this can be only be attained if we segregate business from politics as empty stomachs are easy to buy but employed nation focus on development and peace only. He also requested H.E. Consul General – Afghanistan to ensure provision of multi entry visa to PAJCCI’s members who are all bonafide businessmen as when traveling would be made easy businesses tend to flourish naturally. President UKPCCI lauded the networking meeting conducted and assured that they would host a delegation on the same lines of joint chamber at UK and would participate in PAJCCI’s upcoming activities. Mr. Siraj Kassam Teli, Chairman BMG and Former President KCCI, greatly acknowledged the visionary leadership of Mr. Zubair Motiwala and Mr. Khan Jan Alkozai and ensured that full support would be extended by Karachi Chamber of Commerce and Industry. He also congratulated the team of PAJCCI on delivering the results in such a short span of time and hoped that it will continue in future. The event was also attended by Vice Presidents Mr. M. Yonass Momand, Mr. Usman Bilour, Engr. Daroo Khan along with other Directors Mr. Junaid Makda, Mr. Daood Moosa, Mr. A.Q. Khalil, Mr. Zia Sarhadi, Mr. Ahmad Shah, Haji Hameedullah, Haji Abdul Quyyum Kakar, Mr. Noor wali Yaqoobi, Haji Nizamuddin Tajzada, Haji Hasan and Secretary Generals Ms. Faiza Nasir and Mr. Ahmadullah Afghan. The dignitaries from Afghan Consulate – Karachi included H.E. Shah Ahmed Saeed– Consul General, Mr. Qassim Barakzai, Syed Tariq Iqbal, Mr. Zeeshan Ibrahimi and Mr. M. Nasir Mayar. Other respectable guests included British Deputy Head of Mission – Mr. Mike Reilly, Vice Chairman BMG – Mr. Tahir Khaliq, Commercial Attache’ Pakistan Embassy in Kabul - Mr. Khurshi Marvat, Political & Economic Section Chief US Embassy – Ms. Anupama Prattipati and Country Director CIPE – Mr. Moin Fudda.